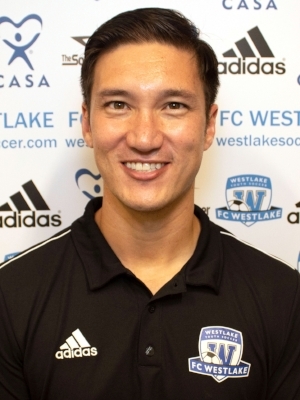 "The thing that attracted me most to FC Westlake is the positive environment that the club is creating for young players. I look forward to collaborating with the outstanding coaches on staff to develop intelligent, creative players prepared to succeed on and off the field." Chris began his coaching career by building a successful boys soccer program at an urban Austin ISD high school with limited resources and few select players. His teams play a positive, possession-oriented style, and players are held to high academic and behavioral standards. The Varsity team qualified for the Bi-District Playoffs in 2017 and 2018 after a prolonged absence from the postseason. The opportunity to work in club soccer has allowed Chris to continue his own development as a coach and to make an impact on the lives of more young people. He enjoys building successful teams and helping players to unlock their full potential. Chris studied Economics at Rice University and has a Master’s Degree in Education from the University of Texas. He teaches Senior economics classes and enjoys spending time with his family, watching Liverpool FC, and sneaking onto the pitch as a player when he is not coaching.